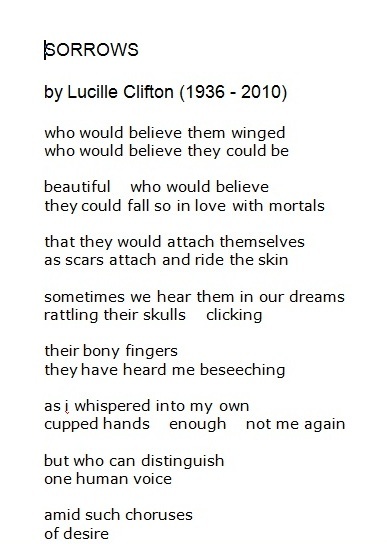 Even if you’re not a regular reader of poetry, make sure you know the name Lucille Clifton and read a few of her poems. You won’t be sorry. Her poems are short and they don’t mess around. She passed away in 2010, so we have a limited supply. The more I read this poem, the more I love it. It’s kind of creepy, imagining sorrows as living scars or skeletons which refuse to leave us alone. But it’s so true. This link will lead you to her bio, a list of her publications, and links to a few more poems. The Hurston Wright Foundation has nominated The Collected Poems of Lucille Clifton 1965-2010 for its 2013 Legacy Award. Thanks for reading, Wilma. It’s so true–a haunting poem for sure. This speaks to me, and I thank you for posting it. I’m going to remember her name and read further. Ah, I’m so glad you like Clifton. I love your blog! I think it is awesome to introduce to your readers someone who is unique and a great poetry writer. Thank you for this! I’m glad you enjoyed her! You’re welcome :). I always appreciate the gift of a new poet! Thank you for introducing us. In the poem, she identifies a something, perhaps the traps built into adventure that make life interesting. Those are the bony fingers. Sometimes they get us. But, it’s part of the plot, the great escape. People are not evil or sad. Those things are bony fingers that sometimes we didn’t evade or come to grips with. Really enjoy this. Bony fingers and all. Oh, I’m so glad you liked Clifton’s poem! I know, “bony fingers and all”–haha. Sounds so awful. But so accurate. Wow! What a poem. 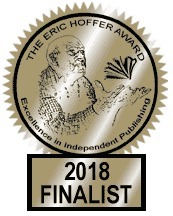 I am so grateful to come across this today – thank you. OH, I’m so glad you enjoyed it, Gabriela. She was an amazing poet. What a richly evocative way to conjure up the power of sorrow. The title to this post really says it all–it does grab hold, just as the image ‘boney fingers” does. I’m so glad you shared this–I have to read more of her poetry now.